Meet Bros is a duo of music directors from Gwalior, India.The duo consists of Manmeet Singh and Harmeet Singh. 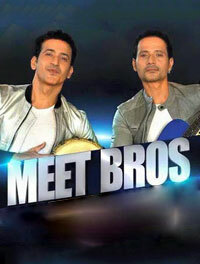 They were formerly known as Meet Bros Anjjan with longtime collaborator Anjjan Bhattacharya. Initially starting out as actors, the duo switched to composing and singing after the success of their first song "Jogi Singh Barnala Singh". They began with composing for Isi Life Mein and Do Dooni Chaar but it was with Kyaa Super Kool Hain Hum and OMG - Oh My God! that they got their first recognition as music directors. Meet Bros'''' most well-known and critically acclaimed songs are "Baby Doll" from Ragini MMS 2 and "Chittiyaan Kalaiyaan" from Roy. Both songs feature the vocals of Kanika Kapoor and the latter was part of a soundtrack that fetched them multiple awards including the Filmfare Award for Best Music Director, the Screen Award for Best Music Director, and the IIFA Award for Best Music Director.